A semi-analytical model considering the biaxial blank residual stress is proposed to predict the machining deformation of the thin-walled parts. 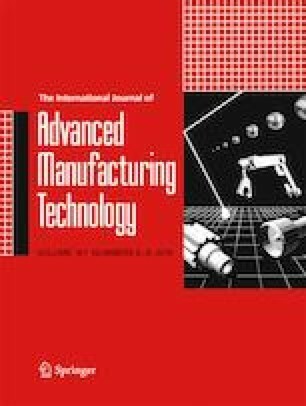 Machining deformations of five thin-walled parts with different stiffening rib layouts are calculated using the proposed model, and the accuracy of the model is validated by FEM simulations and machining experiments. In comparison with the experimental results, the relative errors of the final vertex deformations calculated by the proposed model for specimens 1–5 are 3.08%, 5.66%, 9.15%, 3.60%, and 8.43%, respectively. Then, the influence of the equivalent bending stiffness on the machining deformation is investigated. Results show that, compared with specimen 1, the equivalent bending stiffness in the X direction of specimens 2–5 are increased by 35.48%, 94.02%, 96.29%, and 100.15%, respectively; meanwhile, the maximum deformations are decreased by 23.42%, 30.92%, 30.66%, and 17.72%, respectively. The machining deformation decreases with the increase of equivalent bending stiffness in the length direction, and the equivalent stiffness in the width direction has no significant influence on the overall machining deformation. Stiffening ribs can be added to increase the bending stiffness and decrease the deformation in machining process. The deformation can be further reduced when the stiffening ribs are placed closer to the maximum deformation point. • A semi-analytical machining deformation prediction model of the thin-walled parts is proposed. • Machining deformations of five study cases are predicted by the proposed model, and corresponding experiments and FEM simulations are conducted to validate the proposed model. • The influences of the equivalent bending stiffness on the machining deformation are investigated based on the proposed model. • The results show that the machining deformation decreases with the increase of equivalent bending stiffness in the length direction. Stiffening ribs can be added to increase the bending stiffness and decrease the deformation in machining process. This work is financially supported by the China National Natural Science Foundation (No. 5177041109).